Those were Microsoft CEO Satya Nadella’s words during the opening keynote at Microsoft Ignite this week in Orlando. The answer to those rhetorical questions came minutes later in the form of a strategic partnership announcement between Microsoft, SAP SE and Adobe. The goal? Acknowledge that customer data is massive and available – and create an alliance to handle it, to give companies a full view of their customers, and to improve engagement. This open data initiative puts customers back in control of their data and signifies a move from what McDermott calls “old- school CRM” to a new customer experience – a triangulated view that puts operations, technology and partnerships in each of three corners, with trust and security squarely in the center. This announcement and its thousand-foot view of looking at technology partnerships aligns with Blue Prism’s desire to support digital transformation through enterprise automation. It also underscores our central message, which is that enterprises must be empowered to access all information, in all formats ,wherever it lives in order to unlock the full potential of that information. To succeed there must be a solid partnership of equals with security at the center. A great example of this today is the successful partnership between Blue Prism, Microsoft, the broader partner community and the clients we all mutually serve. 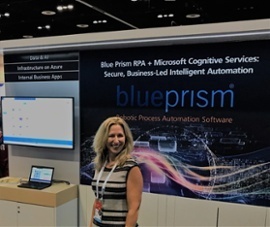 Blue Prism’s partnership with Microsoft includes full integration with Azure Machine Learning, Microsoft AI & Cognitive Services, and Azure Analytics. Beyond delivering an enterprise-scale solution for digital transformation and increased productivity, Blue Prism and Microsoft give enterprises the data and insights they need to change the key internal processes that will result in better customer engagements. Satya Nadella also told the story of Coca-Cola’s transformation journey – one that has morphed over the years into pivotal changes that have affected everything from their bottling practices and production to IT practices and security. A perfect example of what Satya was alluding is the security solution Coca-Cola developed that authenticates and manages credit card transactions. To accomplish this, they turned to a joint solution leveraging Microsoft and Identitii – enabled by Blue Prism Robotic Process Automation (RPA) technology. This solution hits all three sides of the triangle – operations, products and partnerships; keeps security at the forefront, and promotes better engagement with bottling partners. Together, Blue Prism and Microsoft are already helping enterprises unlock data, transforming it to insights through a combination of RPA and Cognitive Intelligence. The collaboration between Adobe, SAP and Microsoft to make data even more accessible will serve to turbo-charge digital transformation through automation, empowering clients to create new ways of working, cultivate better customer experience and un-lock whole new operating models.